You may notice some intervals where Enlighten shows that your system is exporting to the grid instead of fully charging the batteries. This is likely the result of a highly-varying load during a particular 15-minute interval. MyEnlighten shows production and consumption as an average over each interval. During periods of highly-varying load, there can be moments when the power consumed is greater than the power produced, causing the batteries to discharge. During a highly-varying load, the battery can switch between charging and discharging multiple times during this 15-minute interval. Therefore, while the appearance of the graph indicates unexpected behavior, the actual system behavior is appropriate for the conditions. The data shown in MyEnlighten is averaged over 15 minutes. We show readings every 15 minutes for production, consumption, and percent battery charge. However, the Envoy is controlling the battery(ies) second-by-second during that interval, and the battery(ies) will either be producing a lot, producing a little, or even charging depending on the level of available photovoltaic production. There are many situations where the battery may switch between charging and discharging multiple times during this 15-minute window. The average power for the battery(ies) over this 15-minute period may appear to be less than full power. 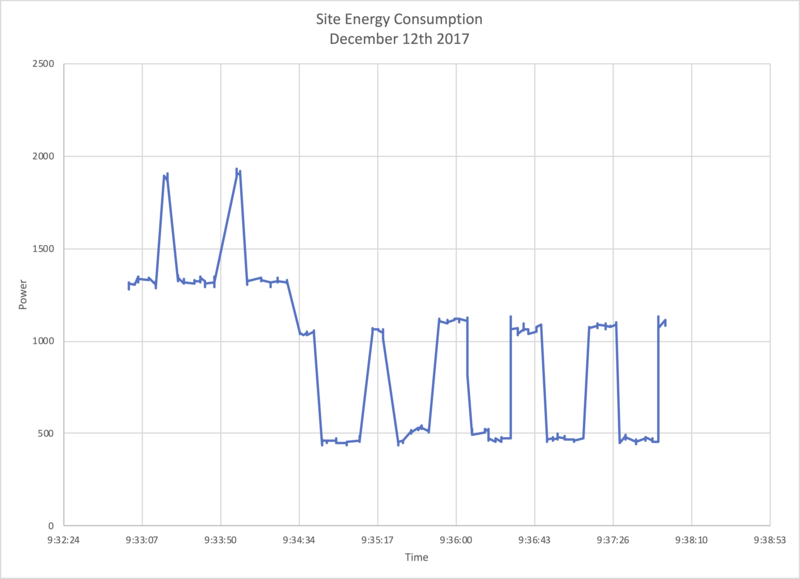 This leads to the misconception that the battery is not fully charging because MyEnlighten shows export to the grid, but doesn’t show the varying load within the 15 minute interval. We investigated this issue were able to poll at a very high rate for a few minutes to capture the graphs below.